I have known and been friends with the founding members almost since the very beginning of the group. Our paths would cross regularly in different theatre festivals around Europe as I toured with my theatre group from Wales – and they with their performances. Groups of young people, like the company we celebrate here, who had taken the decision to try to live, make work and survive autonomously, independently – on the ‘fringe’ of the cultural capitals and outside of mainstream theatre parameters; they were determined adventurers: they found their own masters to teach them; they trained their bodies, and voices – their primary tools for expression – daily and rigorously – they were ‘workers’; they worked to make collective performances that then had to seek an audience – outside of the mainstream. They were audacious pioneers challenging the mores of traditional theatre. They were artists experimenting new working methodologies and new ways of working together, non-hierarchically, collectively, collaboratively, reaching out to local as well as national and international communities and sharing their work in small halls, found venues, on the street, as opposed to aspiring to place themselves and the work within the so called establishment theatres, inhabited primarily by the wealthy middle class. The Grenland Friteater founders swerved, as did so many of that generation, away from established convention. Of course, in the beginning, they might have been dismissed and even rejected as – anti-establishment dissenters, willfully subversive – ‘hippies’ even but they grew from and with these ideals of independent and collaborative ethics and developed into the mature and influential company they are now. And they have never abandoned their founding instinctive ideals: but the circle of people benefitting from the implementation and living of these ideals has ever widened. As the company expanded along with the program of activities, they served their community and through their energy and commitment have put Porsgrunn on the International cultural map. How many towns of this size have a major International Theatre Festival every year that hosts some of the most dynamic, innovative and exciting artists from around the world? How many towns of any size can boast the creative genius of Stedsans involving hundred of local people and guiding thousands of spectators through their own town offering new ways to see, understand and celebrate familiar landscapes. in an age when fewer and fewer independent groups have managed to survive. They have worked very very hard. But above all I believe their longevity and success lays in their intelligent generosity. They have been generous not simply with their time, and labour, but their consistent invitations to the ‘others’ – whether they are international artists, local cultural groups, strangers, students hungry to learn, new actors or volunteers. They have opened their doors and shared their work, ideas, and resources: . They practiced ‘INCLUSION long before it became a buzz word in fundraising jargon. And clearly in time the community – locally,’ nationally and internationally has reciprocated – generously. 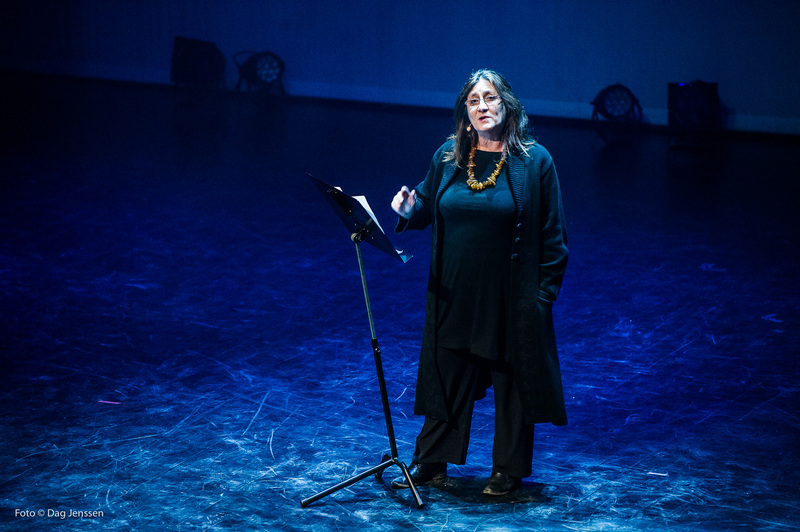 My primary association over the years with the company – has been through the Magdalena Project – International Network of Women in Contemporary theatre. Grenland Friteater were one the first organizations to host a major international festival under the umbrella of The Magdalena Project called A Room of Ones Own – gathering women theatre makers from all over the globe to share their work with each other. This festival was a catalyst and inspiration for many future Magdalena Events that have proliferated internationally and insisted that women’s voice in art is heard. And In 2004 Magdalena Norway launched and initiated, I think, one of the most important and generous enterprises in the projects history: supported by FOKUS – Norway’s Forum for Women and Development – the women of Grenland Friteater brought together a team of renowned women theatre workers in Colombia to lead regular workshop gatherings for isolated women, to help build their voice in their own communities. In all, I think, over 14 groups were active all over Colombia over a six year period – the ripple effect of the of these activities contributes to the transformation of misogynist, oppressive and silencing practices that so many generations of women and girls have endured in that continent – little by little – moment by moment – encounter by encounter. Slow but consistent work. Again the organization and insistence of this project was a huge act of generosity and solidarity. If today a new theatre group of young Norwegians started; what would they aspire to achieve. At the moment in Europe we are living a shame. We place rejection over welcome – boundary over freedom of movement – self-advancement over collaboration. In these times – the young and adventurous could do worse than willfully build on the legacy of Grenland Friteater and with intelligent subversion strive to create spaces and practices to resist the infection of non generosity that is spreading rampantly even as we speak. If they want to live in a world where they receive then simply they need to be the givers.